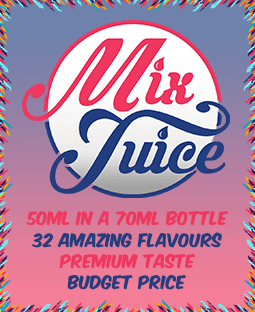 Mix Juice Twister short fill e-liquid. 50ml of liquid in a 70ml bottle, nicotine free. Or available with one or two 10ml vials of Nic Shot to create your desired vaping strength. Get a taste of Summer with our Twister short fill e-liquid. We create that taste you know by blending luscious limes and other summer fruits with a slight hint of vanilla to create a nostalgic vaping delight. The Twister E-Liquid is created using a mix of premium quality VG & PG mixed to an 80/20 ratio. We only use the best flavourings to create our liquids ensuring you get a vape juice that tastes amazing and is a pleasure to vape. This Twister short fills comes 50ml of e-liquid in a 70ml bottle and is nicotine free. You can however, purchase along with one or two 10ml vials of Nic Shot, ready to mix in the short fill bottle to create your perfect vaping strength.